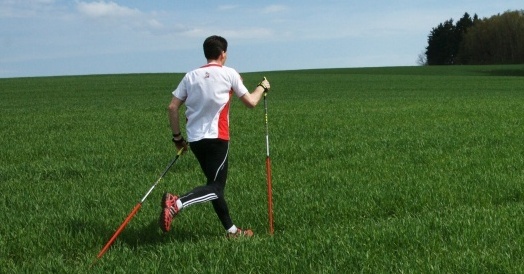 Our measurements have shown a decrease of musculoskeletal system strain when running with poles. This can be resulting from involving the arms, which not only causes a relieve of the musculoskeletal system, but also higher stability of the runner. It has a significant health-preventive effect with longer runs, where the overall musculoskeletal main joint strain is cummulated. According to the distance covered (be aware that a few kilometres mean several thousands of steps), the result figures of the decreased strain would be measurable in tons, resp. tens of tons. Based on the assumtion that vertical forces are also influenced by the runner’s weight and running pace, we can presume there would be bigger differences – higher relief of the musculoskeletal system – at heavier athletes (sportsmen). The vertical force decrease is significant mainly during the first supportive phase. 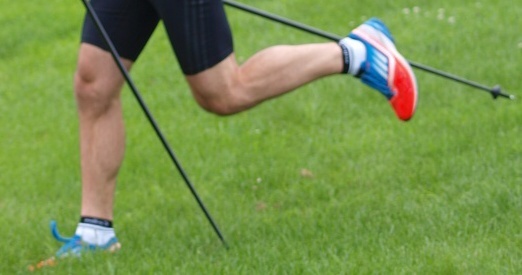 This means that running with running poles does not overstrain the musculoskeletal structure involved in the step amortization (mainly heel and Achilles tendon) so much. Based on the year-round practicing of Nordic running we can unequivocally state that it helps to keep stability even in a soft uneven terrain (parks, grass, fields, forest paths etc.) and on the snow in winter. Thus it significantly decreases risk of injury which is often caused by slipping or spraining.